Explore, discover, share, meet other like-minded industry members, and get ahead, stay ahead, and create industry curves. Find out what’s happening at the SNIA and in the industry. Get the latest news, review work by your peers, and see who’s setting new strides. You can also become a member, renew your membership, volunteer, learn about sponsorship opportunities, and so much more. 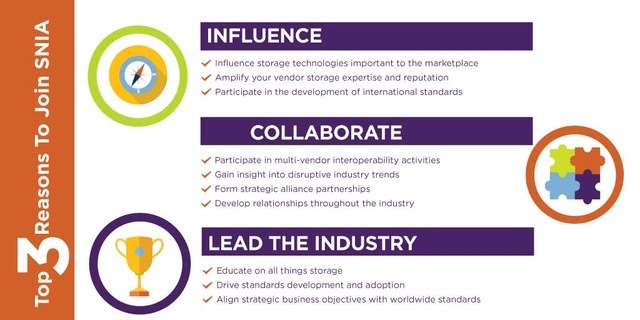 Download the SNIA Membership Brochure. Download the SNIA ROI Brochure. Download the SNIA Tech Infographic for an at-a-glance illustration of SNIA technical work. Download the SNIA Business Development Infographic for an at-a-glance illustration of why to join SNIA.